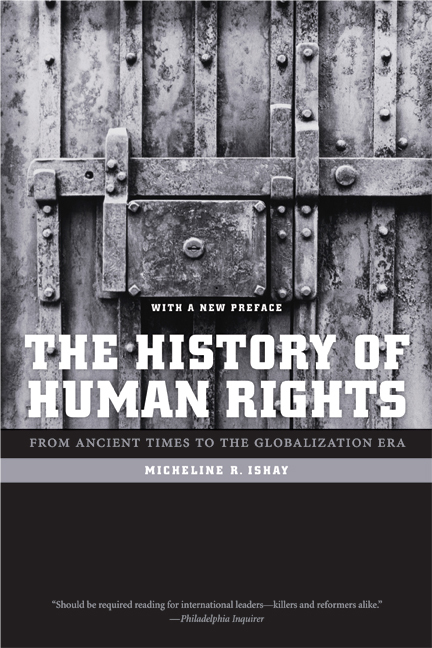 Ishay structures her chapters around six core questions that have shaped human rights debate and scholarship: What are the origins of human rights? Why did the European vision of human rights triumph over those of other civilizations? Has socialism made a lasting contribution to the legacy of human rights? Are human rights universal or culturally bound? Must human rights be sacrificed to the demands of national security? Is globalization eroding or advancing human rights? As she explores these questions, Ishay also incorporates notable documents—writings, speeches, and political statements—from activists, writers, and thinkers throughout history. Micheline R. Ishay is Professor and Director of the International Human Rights Program at the University of Denver, author of Internationalism and Its Betrayal, and editor of The Human Rights Reader. Fraternity, or Human Rights for Whom? The Globalization of Civil Society? Or an Assault on the Private Realm?